Maybe I'll get it finished by end of day today. Then immediately onto a cashmere blend cowl—pretty simple—4 colors, knit in welts. (5 rows/rounds of stocking knit, 5 of reverse stocking knit.. The welt will bunch up like ribs—and will be striped. One side blue and green stripes, the other side, grey and white stripes.---its a holiday present. Of course when it stretches out, you'll end up seeing all 4 colors.. but one side will be predominantly blue/green (with recessed white/grey) and the other side white/grey with recessed blue/green. And I should get back to working on my peachy socks.. (haven't touched them now in 2 weeks!) and then, the contest project, (since that has a dead line!) and then hats, and fingerless gloves, and more patterning writing, and—More tutorials.. The 16 pattern rows? Half are faggoting lace (K2tog/ YO) and half are a leaf (with a single K2tog) motif. --Oh wait—that's not quite right. 8 rows are done with K2tog, (faggoting and leaf) and 8 rows are done with SSK and an other leaf. 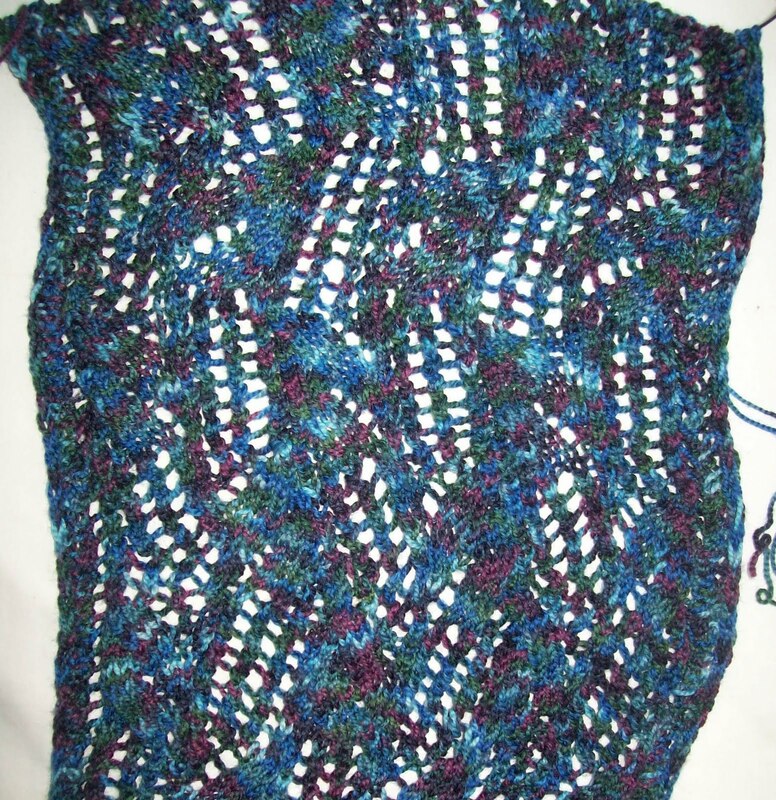 All K2tog's would cause a bias—by alternating groups of K2tog rows and SSK row, the unblocked knit is a soft zig-zag, that blocking makes straight. 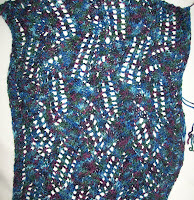 You can see the soft zig zag clearly in the unblocked knitting. But for me, there are NO SSK's. For the first half of the pattern on the “plain rows” I make sure to knit Standard European style purls. And all my stitches line up ready to be knit together and lean Right. For the second half of the pattern, I work the purls in my standard “combo” (aka eastern) purls, and my stitches all line up on the needle reversed—so when it comes to a decrease I already have the SS part of an SSK done.. and I have to do is K2tog. A neat trick that makes knitting a bit faster! If I were working in the round—like say, my peachy socks..with its much simpler lace that also has 50% right leaning and 50% left leaning decreases, (and the purls—there are purls—are part of the rib, but not part of the lace) This trick wouldn't work. To me, the mental effort is easier than the physical! Part of this slow (or radical) change was based on island culture... but even in non island populations—people often remained settled, and didn't travel very far from home very often. But—in US, (or Canada or Australia, or..) where the population is made up in large part, of immigrants, these immigrants brought with them their home town styles of knitting. The knitting groups I belong to have the same multi ethnic mix. And knitting styles,too, are varied. Not everyone in any of the groups I belong to is a multi-”lingual” knitter. Many can just knit in one style, but several can knit in 2 (2 versions of European being the most common--for 2 handed color work) and knitting in 3 styles (2 styles of European, and true left handed, (for entralac!)) is not a unique skill. A few Knit combo, that can (if pushed) knit standard European, and at least one Knitter, in each group knits Eastern--(tensioning the yarn round the neck, working mostly in purls, and using the left thumb to form the stitches.) Others knit using a Norwegian style purl—one churns out color work (of various styles) like a professional, (but has a hard time with cables!) Each group has at least one other knitter (some 2, some more!) who designs. And I think my groups are just a year or two ahead of any group of knitters everywhere across the NA continent for the diversity of knitting styles to be found. And other knitters-- in other less diverse populations, in even the most remote parts of the world are connected (to some degree) to each other via the Internet. And these knitters are learning about, and how to do, other styles of knitting, too. 40 years ago, I was a closet knitter. Every time I knit in public, I got corrected --because other were sure I was knitting WRONG. Now days, I am admired—because I can help almost any knitter, because no matter what their personal style, I know it! But I know from many posts on Ravelry, I am hardy special... LOTS and LOTS of other knitters have my skill set (and more!) The idea that there is one way to knit is fast disappearing! Wanna join us on Saturday in Brooklyn? We'll be knitting at a place off the G train.